The Georgian Black Sea coast is a walhalla for birders, but also ecologists and other researchers are increasingly interested to visit the area. The BRC is deeply committed to help develop a thriving bird research community in the Caucasus, and more specifically in Georgia. We are, therefore, very happy to announce that Wouter Vansteelant will be the first research coordinator at the BRC for the coming 2-3 years. Wouter was a board member of BRC between 2008–2013 and as a Conservation Leadership Intern at Hawk Mountain Sanctuary (PA, U.S.A.) he investigated the influence of weather on route choice of raptors in the Batumi bottleneck (Vansteelant et al. 2014a). 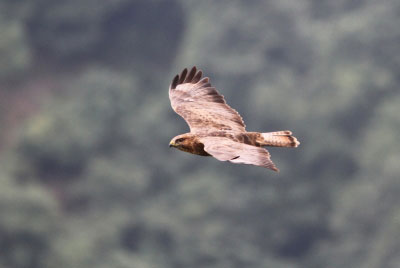 Wouter is currently writing a Ph.D. thesis on the role of weather in the soaring migration of European Honey-Buzzards with the Computational Geo-ecology group at the University of Amsterdam (see for example Vansteelant et al. 2014b). He is also secretary on the board of the Migrant Landbird Study Group which seeks to promote collaborative flyway-scale research projects on Palearctic migrants. Given his experience in both academic research and conservation, we consider Wouter well placed to coordinate research in harmony with our monitoring and conservation efforts. The role of weather in raptor migration: we need to understand how migration counts are affected by weather conditions to infer population trends from count data. Weather influences are also important for impact assessments of wind farms,power-lines and other constructions which pose potential collision risk for raptors. Quantifying the importance of stop-over sites for migrating birds: coastal wetlands such as the Chorokhi delta may be crucial stepping stones for species migrating along the Black Sea coast. However, natural areas are threatened by growing economic development in the region. We need to better quantify the importance of natural areas in the Batumi region for migratory bird populations. In addition to conservation-based research, we will host external researchers that seek to understand more fundamental aspects of migration ecology. Our new research coordinator will be responsible to integrate applied and fundamental research into a coherent research program. Furthermore, at BRC we recognize that research projects provide a valuable training opportunity for young researchers from the Caucasus. Another key role for Wouter will therefore be to integrate education and capacity-building in research wherever possible. We wish Wouter the best of luck and look forward to report on research outcomes over the coming years. Researchers who are interested to work in the Batumi bottleneck are hereby cordially invited to contact Wouter with their inquiries!